Spring cleaning can be a daunting task. Getting the entire family involved with cleaning can make the entire process easier. Here are a few tips to get your kids motivated and actually enjoy cleaning. 1. Show them exactly what needs to be done. Telling a young child to "go clean your room" or "clean the bathroom" is a little unfair. Your version of clean will be a lot different than their version of clean. Not to mention that tackling an entire room can be a little overwhelming for some kids. On a piece of paper (one sheet per room) write down a step-by-step of what needs to be cleaned in that room. For example, the paper for the bathroom could say Step 1: scrub inside toilet, and wipe down outside of toilet. Step 2: Wipe down bath tub. Step 3: Wipe down sink. Etc... Next time you tell your child to "go clean the bathroom", they will know exactly what to do. You can find many lists of age appropriate chores online. However, you should only use these as a guide. Don't just assume that a chore is to hard for your child, if they show interest then let them try. They may surprise you. As long as you practice proper safety (don't expect your 3 year old to put away sharp knives in a drawer) then it is perfectly ok to let your child try chores that are above their age level. Many kids find chores boring and will be more than willing to welcome a challenge. Give them squirt guns to wash the windows and let them have a water fight when they are done. When it's time to change sheets let the kids build a fort and sleep in it for a night before you toss them in the washing machine. Challenge them to see who can collect the most trash around the yard/house. The person with the largest pile gets a prize. Have them vacuum under the couch cushions then let them build a fort with the cushions. 4. Brag about the work they did. When my husband comes home from work and asks me how my day was, I make sure to tell him about how much the kids helped out. I tell him how my youngest helped me with laundry. I also mention how I was able to work on my blog for a few extra minutes because my oldest unloaded the dishwasher for me. When my kids do chores around the house, it helps me out a lot and I want them to know how much I appreciate it. Of course, I tell them all the time how much of a help they are, but it means a lot more when they overhear me bragging about it to someone else. It really gives them a sense of pride in the work they do and motivates them to do more. 5. Let them help you shop for cleaning supplies. 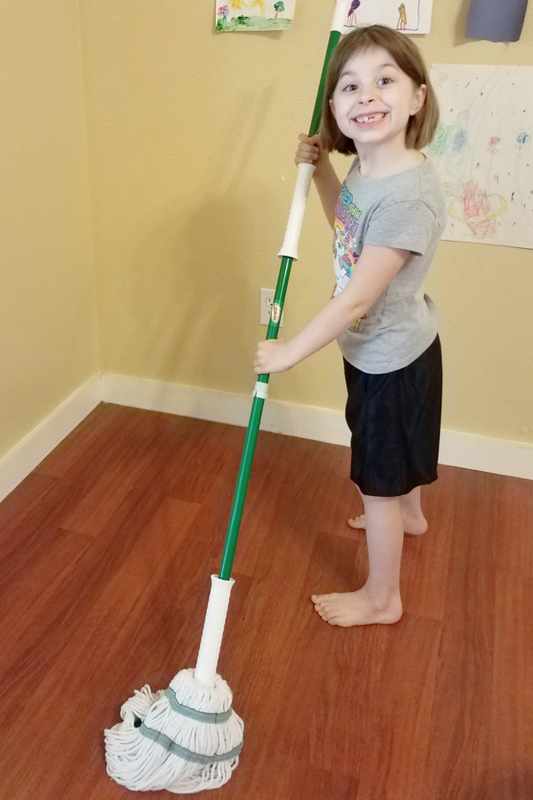 My youngest loves helping mop the floors so when The Libman Company asked me to try out one of their mops I know that she would be more than willing to go to the store with me to get it. 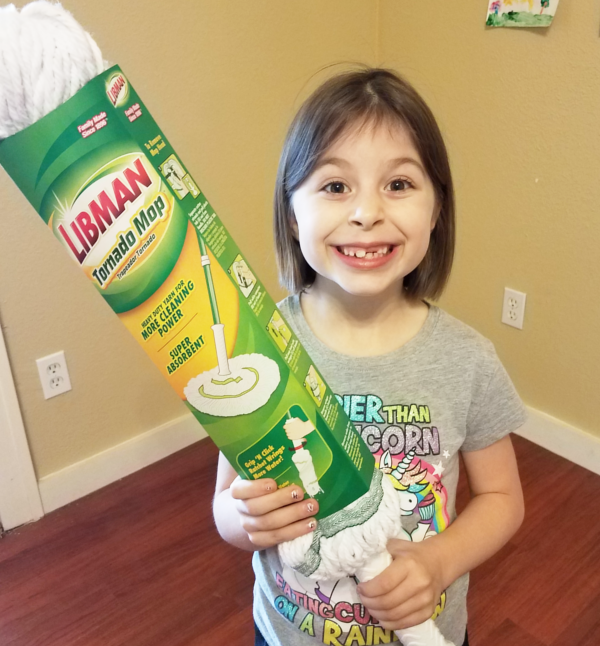 We headed to our nearest Walmart and chose the Libman Tornado Mop. My daughter was so excited that she wanted to try it out as soon as we got home. I've been using Libman products for years now and their mops are some of my favorite. 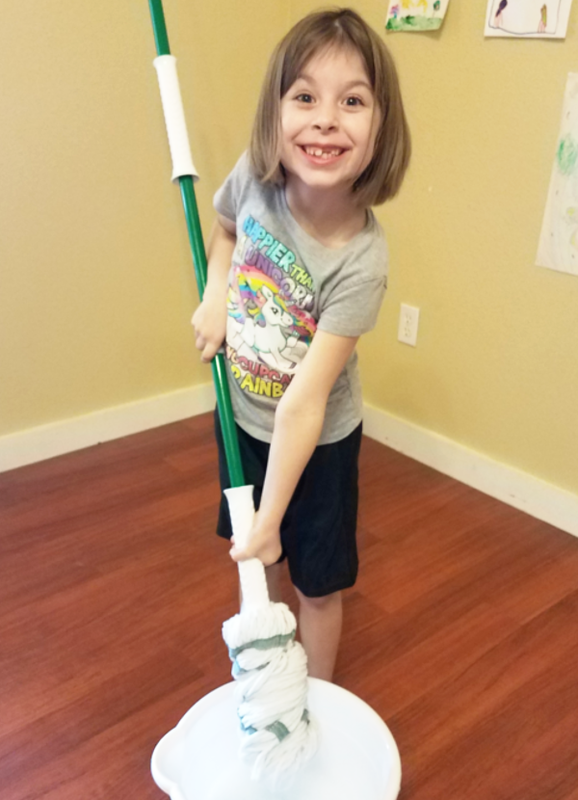 Did you know that the Libman Tornado Mop is America's best selling mop? And for good reason too! 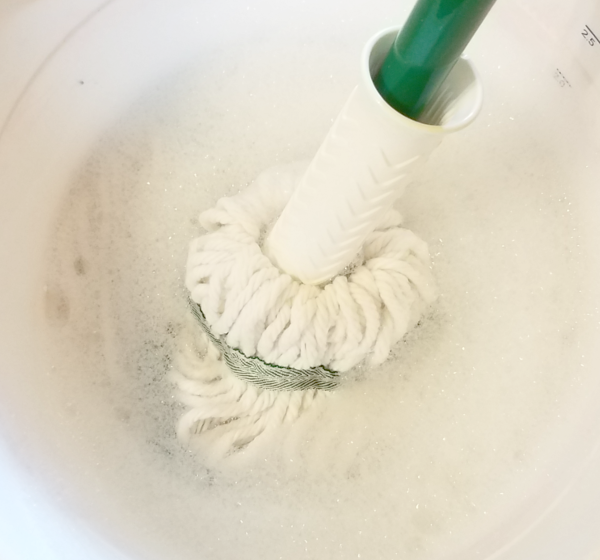 The Libman Tornado Mop has a larger head mop that covers 50% more surface area. The 3 green bands prevent tangling and the polyester yarn resists odor-causing bacteria. It is also perfect for any surface. It's super simple to wring out, even my 7 year old can do it. 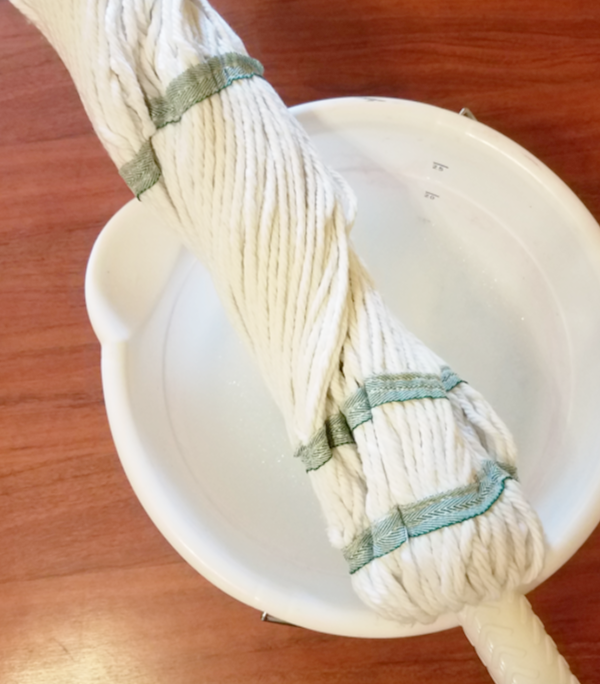 Also the mop head can be removed and tossed in the washing machine for easy cleaning. You can find the Libman Tornado Mop and many other Libman products at your local Walmart. Follow The Libman Company on Pinterest and re-pin sweepstakes-specific board. 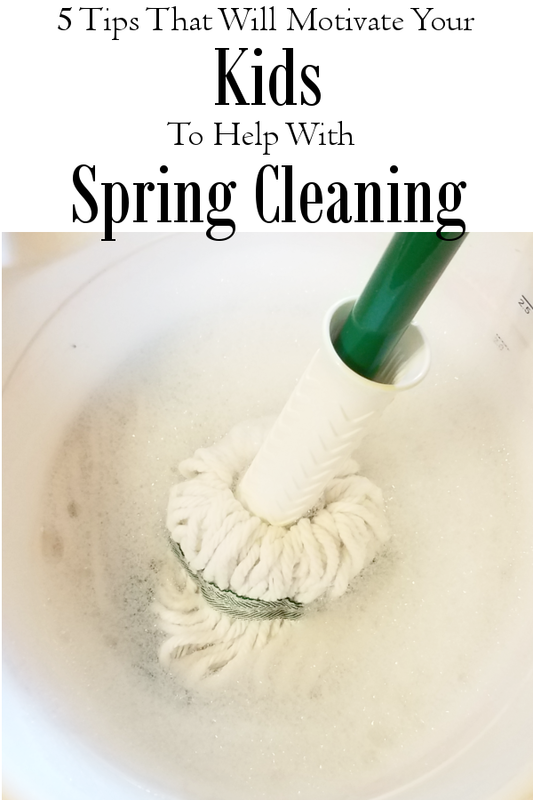 Create a "Spring Cleaning Toolkit" using images of The Libman Company's products and spring cleaning tips from the Pinterest board and then enter your information on The Libman Company's Facebook page. Be sure to invite your friends to enter as well. 5 winners will receive a "Spring Cleaning Toolkit" comprised of Libman products and one additional winner will receive a prize package plus $1000 cash prize. Once you enter the sweepstakes don't forget to download your free coupon to get $3 off the wonder mop when you sign up for the Libman newsletter.